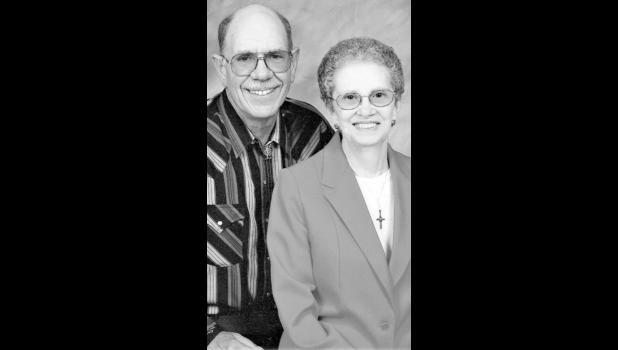 Lorraine Joe Richter, 86, and John D. Richter, 70, of Circleville, passed away at the Midland Hospice House in Topeka. Lorraine passed on Wednesday, Dec. 5, 2018, and John on Thursday, Dec. 6, 2018. She was born February 14, 1932 on the Potawatomi Reservation in Jackson County, the daughter of David Marion and Beulah (Cowger) Wykert. She graduated from Soldier High School in 1950 and was a lifelong member of the Circleville Community. Lorraine was a waitress and homemaker. She was also a CNA at the Holton Hospital, working for Dr. Roy, and the Merry Manor Nursing Home. She was a member of the Circleville Christian Church. Lorraine was a devoted mother and grandmother, and enjoyed yard work, gardening, soap operas and the Royals. She married Willis Shupe in 1950. They later divorced. They shared five children together, Danney, Patty, LeRoy, Alan and Avis. Lorraine and John were married on Nov. 16, 1975, in Bunker Hill, Ind. Lorraine was preceded in death by her parents, a son, Alan Shupe, a daughter, Avis M. Rodney, and two sons-in-law, Greg Logan and Al Rodney. John was born April 14, 1948 in Topeka, the son of Joe and Ada Mae Myers Richter. He attended Perry High School for three years before graduating from Holton High School in 1966. He was a farmer and a stockman. He was a member of the Circleville Christian Church, a volunteer fireman with the Holton Fire Department, Jackson County Storm Spotters, and Circleville Masonic Lodge No. 20, AF&AM. He loved hunting, old vehicles, and visiting with friends and neighbors. Survivors of John and Lorraine include children, Danney Shupe (DeeAnn), Topeka, Patty Logan, Holton, and LeRoy Shupe (Marla), Circleville; sisters, Linda G. Smalley (Robert), Spring City, Tenn., Marie Starkson (Dan), Holton, and Joyce Richter, Beatrice, Neb. ; brothers, Henry Richter (Carol), Holton, and Wayne E. Richter, Topeka; Lorraine’s aunt, Irene Cowger, Holton, nine grandchildren, thirteen great grandchildren, five great-great grandchildren, and many nieces, nephews, and cousins. Funeral services for John and Lorraine were to be held at 10:30 a.m. Monday, Dec. 10 at Circleville Christian Church. Burial will follow in the Olive Hill Cemetery.